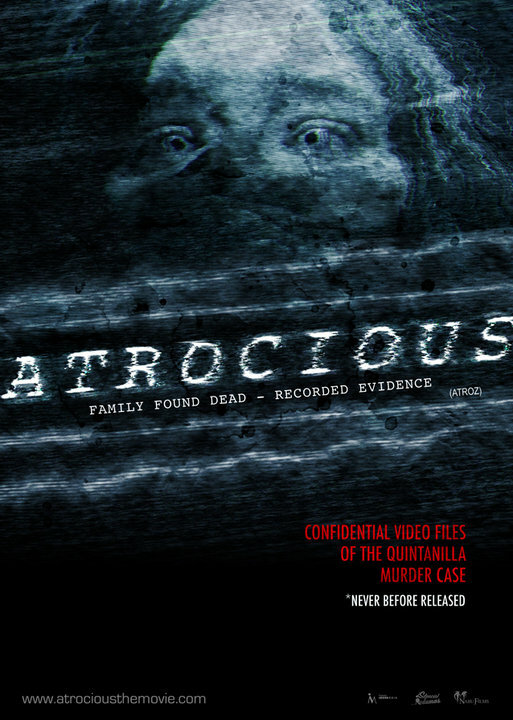 While on a weekend vacation at their remote country manor, four members of the Quintanilla family are brutally murdered. While searching the crime scene, police find a video camera containing footage of the family's fate. Love it or hate it, it seems the found footage sub-genre is here to stay. Atrocious is Spain's attempt and it is obvious that director Luna did his homework and carefully took notes on the structure and plot devices implemented in some of the more popular and successful found footage films, such as The Blair Witch Project, Paranormal Activity, to an extent, [REC]. The film's pacing, the camera angles and shots, and the slow and deliberate build up to a frenzied climax have been implemented in these other films. There is nothing wrong with that, per se, and Atrocious is far from a bad film; it is just terribly by the numbers. Like many other, lesser known found footage films (The Collingswood Story, June 9, Strawberry Estates), there is a long, sometimes tedious build up to the action in Atrocious. The viewer is subjected to the brother and sister discussing and exploring the woods near their vacation home because there is an urban legend involving a ghost of a young girl who haunts these woods. While initially interesting, the footage becomes tiresome, particularly once the viewer realizes that the ghost really has nothing to do with where the plot is going. This is not to say that there are not some genuinely creepy, effective scenes; a particularly scene when the brother is filming the vineyards of the manor at night at catches the glimpse of something or someone watching him from behind shrubbery is jolting. But like most film's of this nature, the real pay off comes during the last ten minutes. The challenge, however, for many will be getting to that point. With that said, the climax of Atrocious is genuinely creepy and unsettling and perhaps the best found footage climax since the brilliant The Blair Witch Project. Everything comes together--the use of the already atmospheric setting, the sound, the camera angles, the color filtering--to create a truly terrifying segment. Certainly more brutal than any of its predecessors, Atrocious projects images during its final minutes that are sure to stick with the viewer: a character, still alive and screaming, crucified to a gazebo, a character barricaded in a small room with the camera intensely focused on the door while he hears thuds, screams, and scratches that are frightening, and a methodical, fateful descent into a basement that is very reminiscent of The Blair Witch Project's final moment. So much happens in such a short time span that the viewers senses are truly assaulted. Moreover, the revelation of exactly who or what was responsible for the brutal murders is, well, atrocious. Unfortunately, as hinted at above, viewers with short attention spans may not make it to the film's climax. The lackadaisical pacing during most of the film's running time is an issue and the main problem is the story itself. While it tries to establish a supernatural element, one never exists so nothing suspenseful or frightening happens until the climax to keep the viewers interest. This element is what made The Blair Witch Project and Paranormal Activity effective; disturbing things happen during their first and second acts to keep the viewer hooked. Atrocious does not have this, which may be difficult for many viewers to overcome, despite its flawless climax, which is probably one of the most effectively frightening scenes of the year.